In order to build the muscles in your arms, shoulders and back, you need the right equipment. Pushups and other exercises can definitely help, but dumbbells make the process a little more tolerable. With this in mind, many people have made the transition to the adjustable dumbbell. 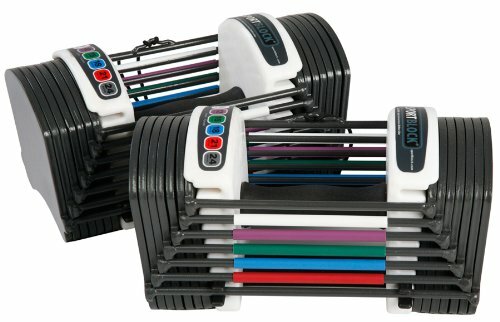 If you’re ever attempted to purchase these types of dumbbells, you’ve likely heard about PowerBlock. When I first took a look at this product, I was a little taken aback. In terms of appearance, they’re certainly not your ordinary dumbbells. Instead, these take a new approach, by using a color-coded system. By using the color system and associated numbers, it is possible to quickly select your desired weight. The chart at the top of the dumbbells helps to distinguish the pin, which needs to be used to select a particular overall weight. The square design is certainly unique, and awkward, but it has a number of advantages. For instance, you can easily grip the dumbbells with two hands thanks to the design. 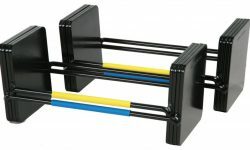 This makes it possible to use them in a bench press manner, or lift them over your head. 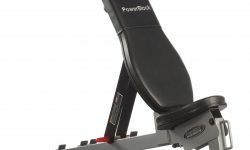 One of the most impressive aspects of the PowerBlock SportBlock 2.4 Adjustable Dumbbell Set is the selector pin adjustment system. When using this system, I can effortlessly adjust the overall weight of the dumbbells, without a lot of trouble. The pin can easily be removed. Once this is completed, the remaining weights will remain, once you’ve lifted the dumbbells. Instead, you will only lift the amount, which was selected. As mentioned above, the pins are color-coded. By using the associated chart, you can quickly determine, which pin to pull, in order to select your desired weight. 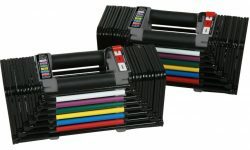 The PowerBlock SportBlock 2.4 Adjustable Dumbbell Set are sufficient for a handful of individuals, since they are capable of providing 24 pounds of weight. Although the company offers a tremendous array of different dumbbells, I thoroughly enjoy this set and feel like 24 pounds is more than enough for my everyday use. Of course, it is possible to adjust the weights in 3-pound increments. With this in mind, the weights range from 3 to 24 pounds. There are 7 different weight settings and the dumbbells are sufficient for replacing 7 individual dumbbells. Overall, the PowerBlock SportBlock is definitely worth the price. This equipment is thoroughly durable and capable of providing the user with tons of longevity. At the moment, I’ve had the dumbbells for more than a year and they’ve maintained their shine throughout. Of course, if something were to go wrong, this wouldn’t be a significant problem, since they come with a 10-year warranty. This is more than what many companies are willing to offer and PowerBlock should be applauded for this. At the end of the day, I can truly say that PowerBlock is responsible for creating some of the best adjustable dumbbells on the market. The SportBlock might not be suitable for everyone, but the 24-pound maximum is more than sufficient for my particular needs. For that, I highly recommend these dumbbells!